and nearly 850 miles of shoreline, Costa Rica offers an astonishing variety of beach possibilities. There are white sand beaches and black sand beaches, sheltered lagoons and world-class surf, beaches with people and beaches with wildlife, upscale resorts and rustic cabins, beaches accessible by air or highway and beaches only accessible by sea or river. The only trick is in finding just the right beach for you. Gentle swimming? Samara or Manuel Antonio - or the beaches at Punta Uvita far south of Puerto Viejo. Playa Grande - A long beach with a strong surf and one of the great nature attractions of Costa Rica: the nesting place of the giant leatherback turtle. Hotel Las Tortugas was designed to minimize disturbance of the turtles and the owners are ardent conservationists. Playa Grande is a place to enjoy splendid isolation, pristine beach trails, tide pools, exploring a mangrove estuary. Recommended: Villa Las Baulas. Tamarindo - Light sand beach of Guanacaste Province known for superb fishing and surfing and also recently awarded 100% on the Bandera Azul survey for beach cleanliness. Local tour operators provide access to watersports (including scuba) and horseback riding. Community maintains a lively mix of tico, gringo, and European styles. Recommended: Tamarindo Diria, Villa Alegre,Bella Vista, Sueno del Mar, Capitan Suizo, el Milagro. Guanamar - This is a rare find: a deluxe hotel in a secluded paradise. Hotel Guananar is situated on a circular bay edged by white sand, no other habitation in sight. The water is calm, ocean swimming good, and boating excellent. Guanamar offers sportfishing, horseback riding, gourmet food, and “romantic sunset walks”. Punta Leona - A beautiful white sand beach on a private reserve less than two hours by road from San Jose makes Punta Leona one of Costa Rica’s best kept secrets. Formerly an exclusive private club for Costa Ricans, Punta Leona preserved its unspoiled beauty while nearby beaches were overdeveloped. Open today to the touring public, it offers some of the best facilities in the country including swimming pools, volleyball, disco, scuba, fishing, and guided tours to nearby Carara Biological Reserve. 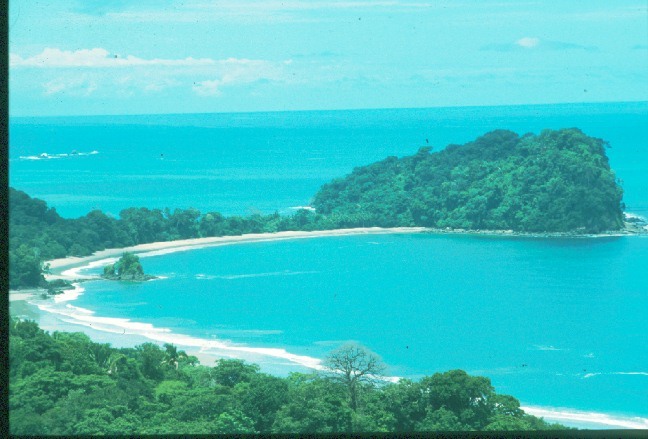 Manuel Antonio - Popular national park on the central Pacific coast offering white sand beaches, rugged seascapes, rain forest, and plentiful wildlife. Easy swimming on the sheltered third beach, surfing off the first and second beach, and snorkeling in the “turtle traps.” Also available: sea kayaking, sport fishing, and horseback riding. Recommended: Villas Nicolas, Casitas Eclipse, La Quinta, Costa Verde, Karahe, Vela Bar. Cahuita - The Caribbean is a different world with reggae rhythms, and West Indian culture. Cahuita offers Costa Rica’s first marine park, protecting a barrier reef, white beaches, and beach forest. The seaside park also offers a wealth of fauna and flora and some of the easiest birdwatching in the country. Accommodations at the Atlantida Lodge across from a black sand beach are simple, but comfortable with ceiling fans, hot water, and complimentary 24-hour coffee.